The Wise and Foolish Dreamers: Wales and the Spanish Civil War exhibition is now on display at the Welsh Centre for International Affairs, Temple of Peace, in Cardiff. 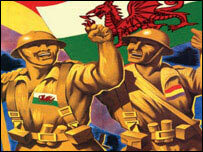 The centre’s links to the Welsh involvement in the Spanish Civil War go back to the 1980s when it began to manage a special fund donated by Welsh veterans of the International Brigade. The money was to be used to maintain links between young people in Wales and Spain. Wise and Foolish Dreamers is the biggest project so far carried out with the help of the fund, and it is supported by the Heritage Lottery Fund. It includes a touring exhibition, a DVD, and a book, which pupils from three schools had a hand in helping to design and produce. The project was launched in May 2007. This exhibition, which consists of 6 large panels and a short film, has already been displayed at the Dylan Thomas Centre in Swansea, Ammanford Library, the National Eisteddfod in Flintshire, Rhondda Heritage Park, Trehafod and Pyle Life Centre in Bridgend. It is at the Temple of Peace until February 12, where there will also be a major conference on February 9-10. Speakers will include Professor Paul Preston.